Foxglove Tree is a tree up to 30 m tall, with a conical crown. It is closely related to the Empress Tree Young shoots, inflorescences, and fruit are yellowish brown velvety. Trunk is straight, about 2 m d.b.h. ; bark gray-brown. Leaf-stalks are about 12 cm, hairless. Leaves are narrowly ovate-heartshaped, occasionally ovate-heart-shaped, up to 20 cm long, 2-parted on new shoots, hairy below, velvety when mature, and rarely sparsely hairy or hairless. Leaves are hairless above. Flowers are borne in narrow and long, somewhat cylindric thyrses, about 25 cm long. Cymes are 3-8-flowered; peduncle as long as flower-stalks. Flower-stalks are hairless. Calyx is obconical, 2-2.5 cm; lobes 1/4-1/3 of calyx length, ovate to triangular-ovate, narrowly triangular in fruit. Flowers are white, purple, or light purple, tubular-funnelshaped, foxglove-like, 8-12 cm ong. Tube is enlarged gradually, slightly bent forward, ventrally weakly ridged, outside hairy. Stamens are 3-3.5 cm, sparsely glandular hairy. Ovary glandular, occasionally stellate hairy. Capsule are oblong to oblong-ellipsoid, 6-10 cm; beak to 6 cm; pericarp woody, 3-6 mm thick; persistent calyx 3-6 mm, woody. Seeds 6-10 mm including wing. The genus Paulownia was named in honour of Queen Anna Pavlovna of The Netherlands (1795–1865), daughter of Tsar Paul I of Russia. 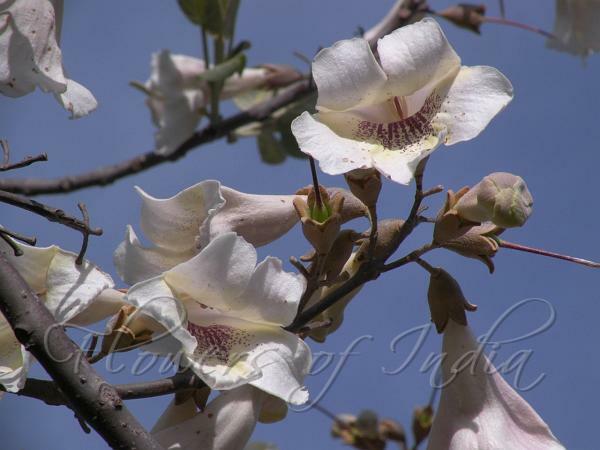 Foxglove Tree is native to China and SE Asia, occasionally cultivated in India. Flowering: March-April.